An exceptionally moving story of triumph against all odds set during World War 2, from the acclaimed author of "Jefferson's Sons" and for fans of "Number the Stars." Nine-year-old Ada has never left her one-room apartment. Her mother is too humiliated by Ada's twisted foot to let her outside. So when her little brother Jamie is shipped out of London to escape the war, Ada doesn't waste a minute -- she sneaks out to join him. So begins a new adventure of Ada, and for Susan Smith, the woman who is forced to take the two kids in. As Ada teaches herself to ride a pony, learns to read, and watches for German spies, she begins to trust Susan -- and Susan begins to love Ada and Jamie. But in the end, will their bond be enough to hold them together through wartime? Or will Ada and her brother fall back into the cruel hands of their mother? This masterful work of historical fiction is equal parts adventure and a moving tale of family and identity -- a classic in the making. 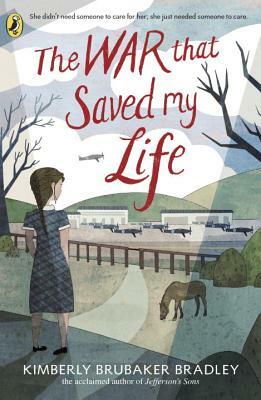 The War That Saved My Life is a book for young readers by Kimberley Brubaker Bradley. Ada Smith is a useless cripple, or at least, that’s what her mother says. Because of her twisted foot, she’s confined to their flat, while her beloved brother Jamie freely roams their London neighbourhood. It’s 1939, and Hitler is about to invade, so Jamie is to be sent to the country, along with hundreds of other children, for their safety. But Ada is determined not to be left behind. When they get off the train in Kent, they are assigned to an extremely reluctant Susan Smith. They are surprised to be treated so well by her, certain that they do not deserve it and unconvinced they will be allowed to stay. But stay they do, and while not everything runs smoothly, they are very glad not be hungry and cold. Ada is immediately drawn to Butter, the pony in the attached field: her dream is to ride and jump fences. Jamie is drawn to the pilots at the nearby airfield, and Susan is forced to emerge from her long-standing depression to care for her vulnerable charges. Bradley gives the reader a view of wartime Britain from the perspective of a ten-year-old whose life of hardship and cruelty has made it difficult for her to trust others or believe in herself. Ada’s ignorance and naiveté make for a refreshingly different view of the social customs and accepted behaviours of the time. Ada’s slow but steady emotional development, her resolute spirit and her courage are an inspiration. Readers will feel like cheering at the point that Ada declares “…my foot’s a long way from my brain”. Bradley presents this episode in Britain’s history in a form that young readers will appreciate, learn from and enjoy: a moral tale wrapped up in an adventure story. She beautifully illustrates the detrimental effects of abuse and neglect, and the positive power of care, support and love. This critically acclaimed 2016 Newbury Honor Book is a moving and uplifting read.